24hr emergency boarding up service. Boarding up windows and doors is a fast and efficient way of securing your properties windows. A properly secured entrance makes it impossible to enter without extreme force. 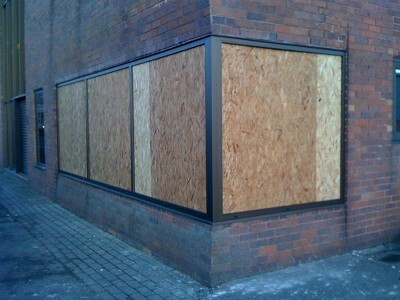 A property may need its windows boarded for many reasons, for example, vandalism, shutting down a shop or a a temporary block if you are missing a window. At KeyWise we have a wide range of experience of boarding up windows for many reasons. We use a technique that involves carriage bolts, so it is impossible to undo the bolts from the outside and in 99% of cases we don’t have to drill into any brickwork to secure your property. Once it’s time to remove the security boarding, KeyWise will come back out and remove and boards within the quoted prices and also when it’s most convenient for the customer. We might be able to assist you further with the replacement of glass made to order from our suppliers and we also have friends in the window fitting industry that are fully fensa registered. Our locksmith and construction industry experience is also very handy when it comes to boarding up and replacing windows. If you have any questions please do not hesitate to Contact Us for friendly advice or a free quotation.